Java is the most popular programming language in the software industry today. Originally developed by James Gosling at Sun Microsystems in 1995, now it is controlled by Oracle Corporation. Have you heard about the big fight between Oracle and Google regarding android coding? Well, it was all because of Java! So let’s start our code journey of Java from this tutorial of java. Surprisingly, this program gives a message to the console: In life, sooner or later, you have to learn Java. Now assume you have a computer, and you want to do Java coding. What do you need to do? This java tutorial or core java tutorial is designed for beginners to learn java. This tutorial is very different from other tutorials online because here we are concentrating on how to teach java from scratch. Core java is very important to learn and this tutorial can be called as core java tutorial. Go to http://www.oracle.com/technetwork/java/javase/downloads/index.html , download JDK ( make sure you download the JDK and not the JRE) and install. JDK stands for Java Development Kit, which is needed if you want to code in Java (of course you will do coding in Java). Now, just in case you say, I don’t need to code, I just want to run a Java program, then you need JRE only. JRE stands for Java Runtime Environment. The above link also contains a download link for JRE, but of course, you will not download that. Ok, you are clever enough to ask, don’t I need JRE at all? How can I run the program I have developed on my machine? Here is your answer : JDK contains JRE. So downloading JDK is enough to both build and run Java on your machine. Where were we? Yes, you have downloaded JDK and installed it. Now do some more setting. Set the JAVA_HOME variable. By default, the path for installed JDK is C:\Program Files\Java\jdk1.7.0_21. Just copy the folder path (including jdk., in my case the version was 1.7.0_21. Your version can be different from this version). Right-click the My Computer and select Properties. Go to ‘Advanced Systems Setting’ link in the left navigation bar. Go to Advanced Tab. Click Environment Variables button. 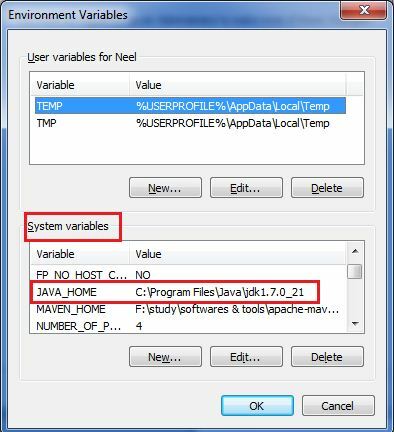 Under System Variables, click New. Add a semicolon (;) at the end. Unfortunately, you are not done! Sometimes this changes to get reflected, you need to restart your machine. May be you have noticed the similarities among the values of JAVA_HOME and the value we have just appended in PATH. In fact, if you add \bin in the end of JAVA_HOME (C:\Program Files\Java\jdk1.7.0_21) , you get exactly what we have appended in the PATH. So alternatively you can also append ;%JAVA_HOME%\bin to PATH. 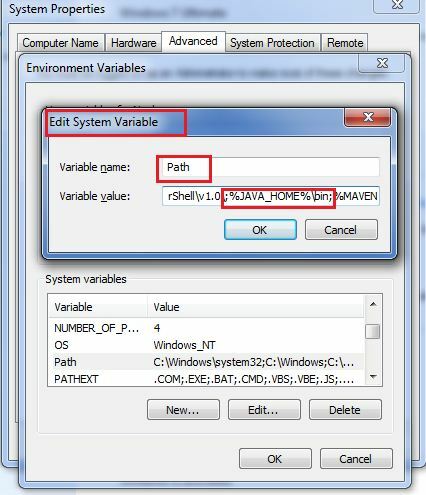 The set up instruction given above (for JAVA_HOME and PATH) is for Windows 7, if you have different operating system in your machine ( such as UNIX) then make sure you set the ‘JAVA-HOME’ and PATH correctly. To check if JAVA home is set properly, you need to run the following command in command prompt. If it is set, it will show this message in Command prompt. Now Run a Program in Java! Let’s say you have saved the file in F:\My Java Learning Begins. In case you are curious, you can type dir command now. You will see that in your folder F:\ My Java Learning Begins another file has been created. The files name is LearnJava.class. In life, sooner or later, you have to learn Java. You have just successfully written and executed a java program. Maybe the program is easy (and of little significance), but you have crossed the first hurdle. If you program is syntactically correct, javac will not send any message. But, if there is an error, it will display the message. Now, consider a different scenario. Let’s say, in your program you trying to divide 40 by 0, you will get a runtime error, i.e while running the java code using the command: java LearnJava (for our example). the compiler will not tell you anything. For the java compiler, the program is syntactically correct, it does not care whether it is possible to divide 40 by 0 (Now, these type of errors are called “Exception”, and eventually we will surely talk about that). After successful compilation (using command javac), the compiler will create a .class file for the program. Now, maybe you have heard that Java is platform independent programming language. What is meant by platform independence? It means that you can take a .class file from any machine and take the file in any other machine it will run and give the same output. In our case, we have created the LearnJava.class (because luckily, our program was syntactically correct). Now if your dear friend says “Give me your program, I want to run it”, you can just pass him/her the LearnJava.class file, and that’s it. Can you tell what he/she needs to run it? As we have learned that in order to run our java program, we need JRE, so your friend will need to install JRE and he/she is set to run your program. It does not matter whether the operating system your friend is using in his machine is different from you as long as he/she have JAVA and JRE installed in his/her machine. 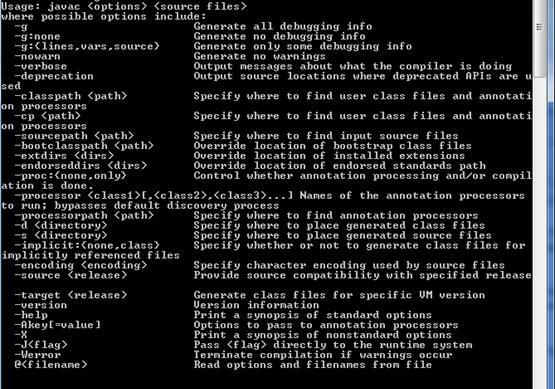 This feature is called Platform Independence or Write Once Run Anywhere, one of the main characteristics of Java. That’s it for today, in the next lecture we will analyze the program in more details and will tell you how to use one of the most popular JAVA IDE for programming: eclipse. Our life will be more pleasant then! Go to next pages of java tutorial where we will explain in detail how to learn java.